THE NEXT LEVEL OF RIMFIRE, FOR SHOOTERS OF ANY LEVEL. Remington® rimfire rifles are among the finest available today for a simple reason: We build them with the same standards for accuracy and flawless function as our high-end centerfires. The new value-priced member of our rimfire family - the bolt-action Model Five - is no exception. We focused on delivering value without sacrificing our performance criteria. The Model Five is a solid choice for the seasoned small game hunters and target shooters, and beginners alike. It's available in standard .22 Long Rifle and .22 WMR. Our American-made brown laminated stock combines good looks with extreme weather resistance. 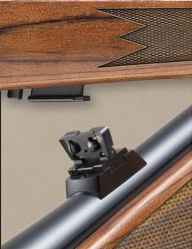 Mount a scope to its grooved receiver or use the fully adjustable open sights Its ultra-reliable bolt action has a five-shot detachable magazine box. Receiver machined from solid ordnance grade steel results in centerfire rifle type strength. Model 504 trigger group, fully adjustable by a Remington® Authorized Repair Center. Bolt features dual extractors for positive feeding and uniform cartridge support. 20" satin blued carbon steel barrel with 5-R Button rifling (same as Model 40-XR Target Rifle) and recessed target crown. Six round detachable metal magazine box fits flush with bottom of the stock.